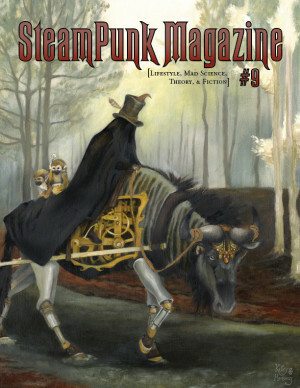 Steampunk Magazine » The Steampunk Challenge! Want an excuse to read a year’s worth of Steampunk Novels? Rikki at the Bookkeeper is sponsoring the Steampunk Challenge, a year from October 2010 to October 2011 of reading steampunk fiction! The website has some suggested book lists and reviews. I would add to that recommendation any of the fine stories published in Steampunk Magazine! If you participate, you get a shiny button to put on your website. I’ll keep a special eye out for short story links, and possible book reviews for the occasion. If you read a particularly awesome book in the coming year (or any time, really!) and want to review it yourself, shoot me an e-mail or comment here and maybe we can even get some guest posts going! Hi there, thanks for sending people my way. I really appreciate it. I wrote a sorta long segmented prose-poem (page and a half typed out) years ago called “Partying on Sobe with Jules Verne and the Gay Club Crowd”… I’ve a Masters in Creative Writing (for whatever that’s worth) and have published journo pieces as well as poetry. IF I discover something worth a review or shout-out in the genre of Steam (I can think of a few recent post-apocalyptical contenders) I’ll be sure and contact yer zine with story but 4 now would really like to pub my poem of a decade ago, which I’ve subtitled “An Early Steampunk Reverie” as it sorta is. If you might be interested in this admittedly hybrid and partly explicit tone about a Jules Verne man in his Submarine Nautilus under the South Beach Gay Party Scene. I am sure I can pub it elsewhere but the Steampunk novelty really appeals to me and I am hoping my eclecticism may appeal para tu!